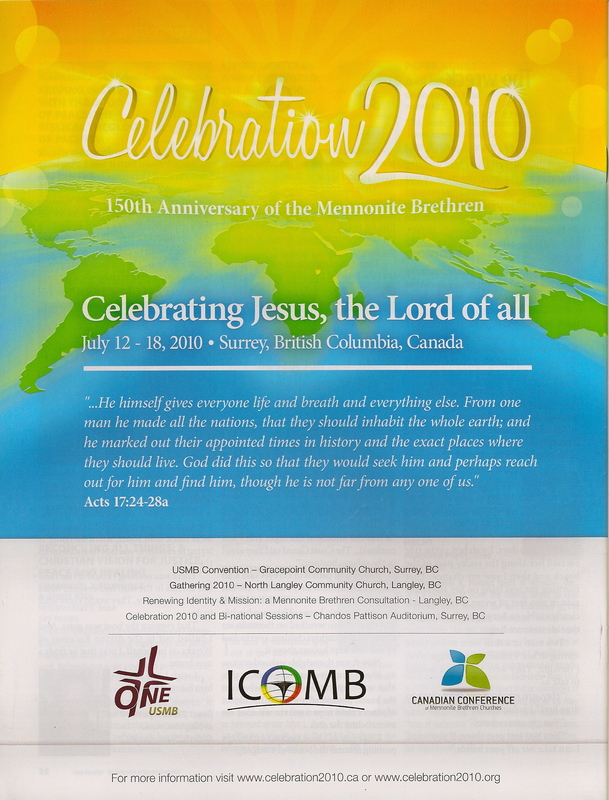 Speaking of commemoration (previous post), the particular Mennonite group to which I belong — the Mennonite Brethren — celebrates its 150th anniversary in 2010. It will be interesting to watch what emerges. Will the commemorative process serve as an archive of the community’s dominant memories? Will it be an agent in forming memory, in controlling it, or in contesting it? Events and writing planned for the anniversary of which I’m aware of are the January issue of the MB Herald , at least two books, a spring commemorative event in Europe with global MB representatives, and a July gathering of North American MBs in British Columbia. For the latter, the tone struck so far (see poster, below) is one of celebration, though it also includes a symposium on identity and mission. A former colleague, MB Herald assistant editor Karla Braun, raised some good questions about what it is we’ll be celebrating in a blog post here. Her post grew out of remarks from a leader within the Lutheran World Federation — coming up to their 500th birthday — who noted that while Lutherans were “proud of their theological distinctives,” they would not be “celebrating” their birthday because of the divisiveness of the Reformation. The birth of the MB Church on January 6, 1860, when 18 family heads in the Molotschna Mennonite colony of Russia/Ukraine signed a document of secession from the larger Mennonite Church, was contentious and divisive too. As for theological distinctives, like the Lutherans, we’re proud of ours. We name ours “evangelical-Anabaptist,” though unlike the Lutherans, we may be less sure what our label means and how to sit on our particular fence without teetering. We seem confident and “successful,” but there are questions about “identity,” and this past year, while closer to the institutional center, I sometimes sensed an undercurrent of fear. Our year of commemoration may be merely a blip in our historical consciousness. Or it could turn out to surprise us with its significance. “What might a clear-eyed, unflinching gaze at our past reveal to contrite hearts?” Karla asked. For now, we’ll have to wait and see. This entry was posted in History, Mennnonite Brethren and tagged commemoration, document of secession, evangelical-Anabaptist, January 6 1860, Mennonite Brethren by doradueck. Bookmark the permalink.